EVER HAD MATCHA GREEN TEA?? I am sure you have seen the posts on my Facebook page and wondered what that green stuff was that I am putting on just about everything! Well it is matcha Green Tea powder and I am personally in love with this stuff. Of course I use it nearly every day of the week! A cancer-fighter, a fat-burner, and much more, matcha leaves other green teas far behind. Every day, countless people throw away valuable antioxidants and minerals. While seemingly unimaginable, that’s exactly what happens when you brew a cup of green tea because water can only extract a fraction of green teas benefits. The majority actually remains unused, trapped in the tea leaves. In reality, the only way to truly take advantage of green teas full potential is to consume the entire leaf. But that doesn’t mean you need to start eating tea leaves. The simplest solution is to just enjoy a bowl of matcha. Because matcha is straight, stoneground tea leaves, matcha provides you with green teas powerful arsenal of vitamins, minerals, antioxidants, and amino acids in a way no other green tea can. 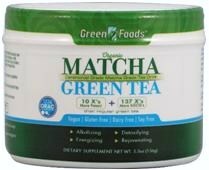 In fact, to even begin to match the potency found in a single serving of matcha, you would need to drink at least ten cups of brewed green tea. 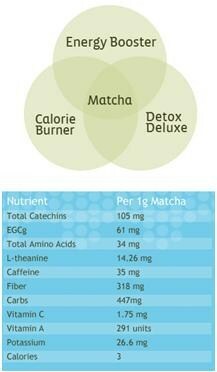 When it comes to helping you achieve and maintain optimum health, matcha is without equal. Here is a brand that I have purchased and I enjoy! 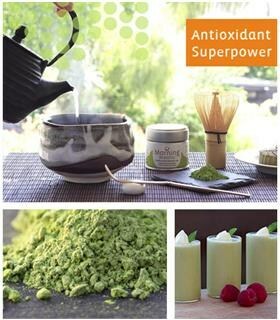 Check out my Pinterest page under EVERYDAY EATING for 21 uses and recipes for Matcha Green Tea Powder!! Need more information on the wondrous powers of Matcha? Check out this article by Bodybuilding.com.